drawmein: Fourth Appearance! Blue Beetle #15 by Freddie Williams II! Fourth Appearance! Blue Beetle #15 by Freddie Williams II! I first met Freddie at the 2006 San Diego Comic Con. I knew he was the new Robin artist, and I had just decided to start up Robin again shortly before the trip. I had him sign an issue and talked with him and learned many interesting things. I didn’t give him a flier that summer, but quickly aimed at correcting that mistake when he attended the MoKan Convention in October. I talked more with him and he took to the campaign quickly. 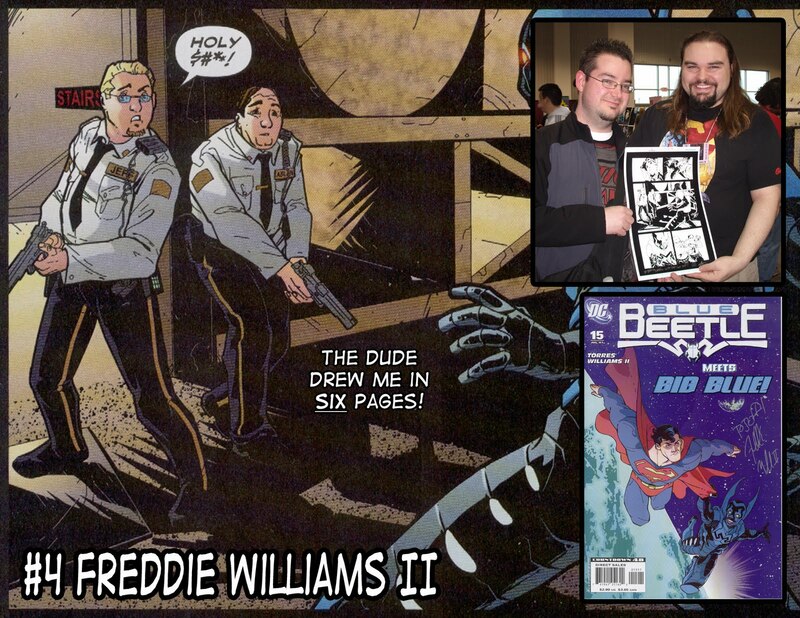 The following February I received an e-mail from Freddie informing me I was going to be in three pages of Blue Beetle! Excellent! Multiple pages and my first DC appearance! Then in May Blue Beetle #15 hit stands, and totally exceeded expectations. I was now a character in six pages, eleven panels, complete with speaking roles and two panels shared with Superman! In September I went to the Free State FreeCon in Lawrence Kansas where Freddie was in attendance. 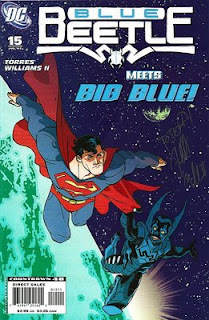 As he saw me approach his table, he quickly grabbed an issue of Blue Beetle #15 and asked ME for an autograph. That’s just cool. I would say Freddie Williams II has raised the bar pretty high for this campaign. Thanks for all your help Freddie.